From the left: Garfield mechanical metal nose-thumber, Robert Kennedy paper dress, Al Smith pin with trademark derby. Courtesy of the Museum of Democracy. Now through Nov 4th The Museum of the City of New York is presenting an exhibit and public program Campaigning for President: New York and the American Election. From the time that it hosted the first presidential inauguration in 1789, New York City has always played a pivotal role in national politics. Campaigning for President: New York and the American Election explores the effects of New York on the strategies of presidential electoral campaigns for over 200 years and highlights the role of New York candidates, third parties, powerbrokers, and voters in the race for president. 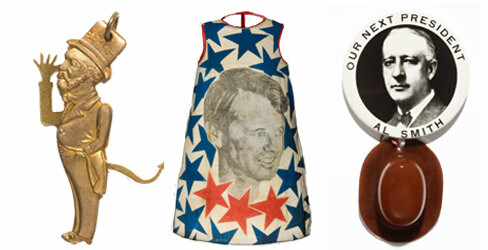 The exhibition features rarely seen, provocative, and often humorous campaign memorabilia from the collections of the Museum of Democracy, including a commemorative coat button from George Washington’s inauguration, a James Garfield oil lamp, A "Robert Kennedy for President" paper dress, and an original copy of the famous "Dewey Defeats Truman" headline. Presented in collaboration with the Museum of Democracy. Subscribe to Museum E-News for more information about Campaigning for President: New York and the American Election.